to be perfectly honest, the Holiday season is typically not my favorite time of the year, but i made a concerted effort not to be a total Scrooge this time around. 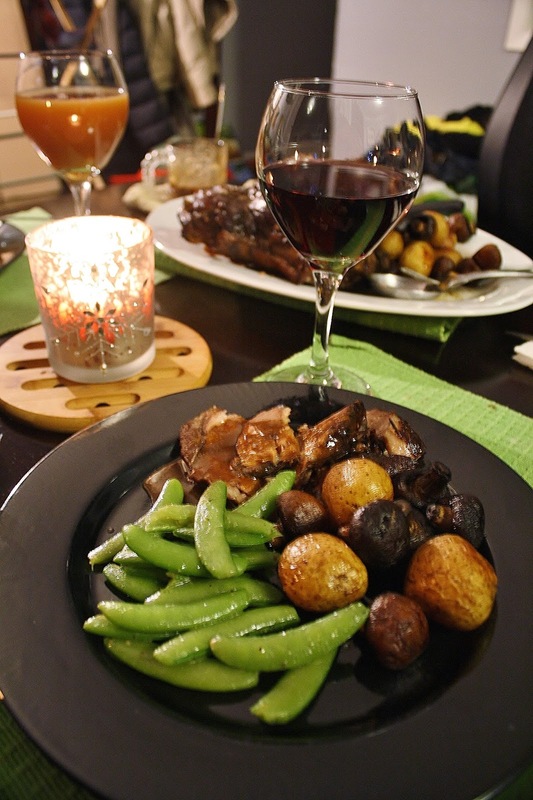 apparently it worked a bit too well, as not a single one of my attempted photos of our Christmas dinner (lamb, roasted baby potatoes and whole mushrooms, and sugar snap peas) turned out even remotely in focus. guess it could be said that i didn't exactly get into the Christmas spirit, though quite a bit of the Christmas spirit got into my glass. cheers!!! yesterday, i stepped into the -20°C (that's roughly -5°F for my fellow Americans) Montreal air just long enough to carry the trash out to the corner of the building, and by the time i got back inside, my lungs were absolutely screaming in pain. slumped there on the floor just inside the apartment door, coughing so that my whole body shook violently, i was struck with the disappointing realization that this was how i would start the New Year. i usually complain non-stop when i'm sick. luckily, i have the internet and a lot of yarn to keep me distracted. this was a swatch i knitted and blocked on the previous night. 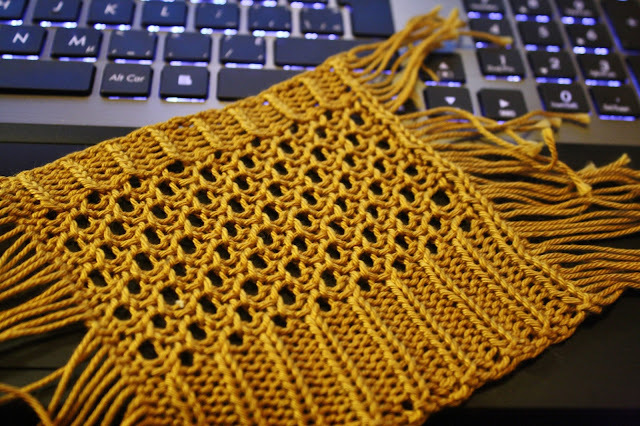 it's a little honeycomb lace over 3x1 ribbing done in a sport-weight mercerized cotton yarn. i twisted the stitches in the ribbed section at the top, which made it a bit too tight for the lace, so i will stick with the regular ribbing, like at the bottom of the sample. 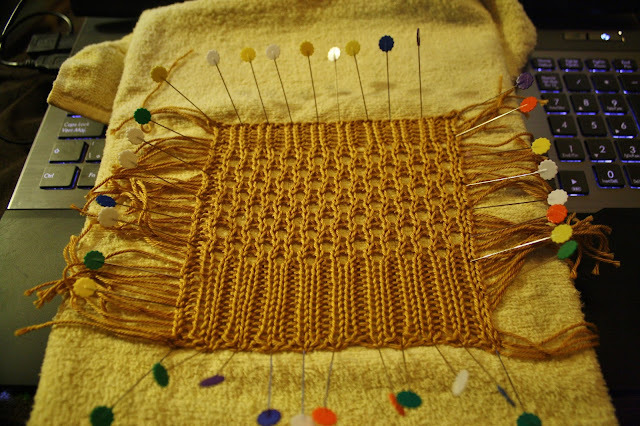 this is intended to be knitted in the round (i.e., in a tube), so i carried the yarn across the back of the work at the end of each row, so that the knitting was all done on the right (front) side of the piece. the carried strands were cut before blocking, meaning that i won't be able to unravel the swatch and reclaim the yarn if needed, but it was worth the sacrifice. it even looks good from the back side... which, i'm sure you will agree, is never a bad thing. 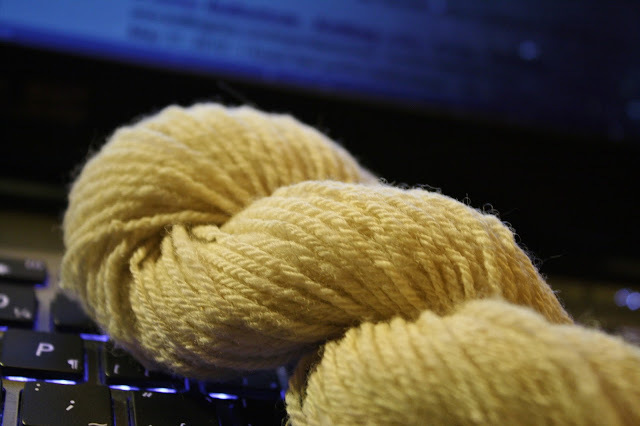 i did a bit of experimenting while sorting through the Cheviot fleece i purchased last month. this was my first time spinning in the grease (which simply means, before washing any of the dirt or grease from the raw wool). 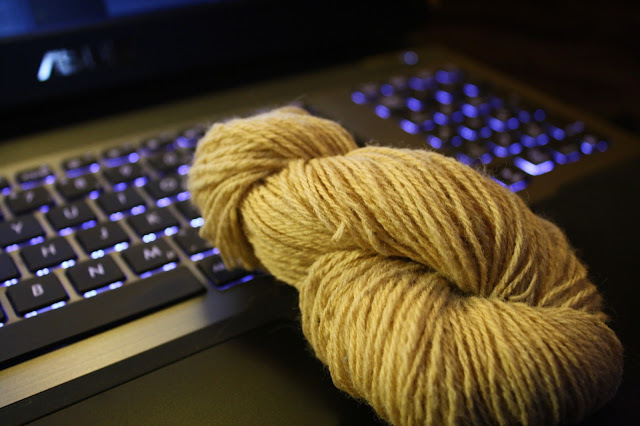 i purchased a pound of lightly-washed wool some years back, and it was an absolute joy to feel the slippery fibers slide through my fingers as i spun, but this was my very first time spinning the stuff as it comes right from the animal. 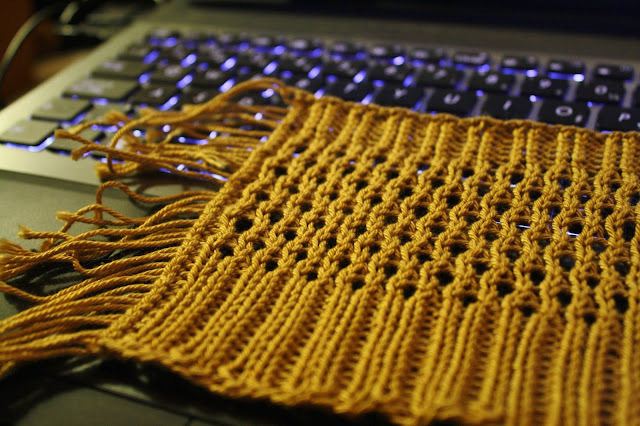 after washing with a small amount of the baby shampoo i keep exclusively for yarns and fibers, it looks pretty good in the magical glow of the screen. i'm already looking forward to the Spring shearing season so that i can get my hands on a fresh, greasy fleece.